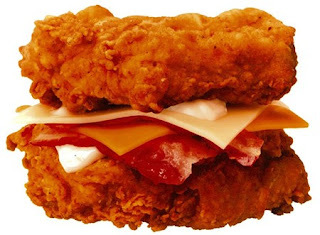 Kentucky Fried Chicken Japan will start selling its new item 'Chicken Fillet Double' (also known as Double Down in US) on 2nd February. Two pieces of chicken breast meat will be used in place of buns. Stuffed between them will be a slice of Gouda cheese, cheddar cheese, bacon and mayonnaise. It costs 450円 by itself and 500円 with an M size drink set. For those lucky enough to be in Tokyo now, KFC Ikebukuro Sunshine Doori is giving away this masterpiece for free on 20th January from 10am to the first 100 customers. All you have to do is flash them this coupon. KFC has also appointed Tamura Atsushi of London Boots as its temporary marketing manager on Twitter to spread the delicious news.